This is a most attractive soft covered book of 100 pages, which deals with the native peoples of the northern Flinders Ranges of South Australia, and their adaptation to the plants available as foods, medicines, implements and weapons. It delves into the surges of contact with the Europeans as the expansion of the colonies consumed more land for practices that we are now regretting and yet at the time were the only ways that the settlers knew for survival. 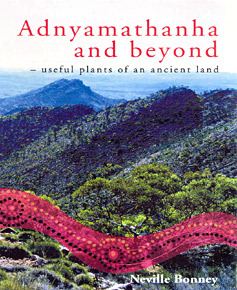 Neville Bonney in producing this book has assisted the Aboriginal people of this region in their bid to keep alive the traditions of the Adnyamathanha culture. By recognising the worth of the profound depth of knowledge accumulated over vast generations, not only is the understanding of plant material passed onto modern generations but it is also a record of the way these people interacted with their environment, which at times could be very harsh indeed. Neville was given the opportunity to work with the communities of the area to produce this book as a record that would serve as a reinforcement of experiences of visitors as well as documenting the role plant material played in their lives. In a somewhat subjective way he discusses the white man's arrival, the explorations, historical changes and the insensitive ways that the Udnya (local native inhabitants) were treated and their knowledge ignored - a typical response to so many native cultures worldwide. To these original inhabitants the knowledge of plants has been passed down from the 'Dreaming' and, as we have discovered, many existing species are in the fossil record. The usage of plant material has been extended over the generations and the knowledge has been shared with white settlers and academics, as too was land management through fire etc. and over the years recorded in publications. The useful plants are recorded in detail in chapters on Useful Trees, Small Trees, Grasses, Sedges & Reeds, Scrambling & Twining Plants, Large Plants and Small Plants & Lilies. There is plenty of good pictorial information and the species are treated in the broadest sense outlining how the plant can be utilised in every way. The native and the botanical name is given, its preparation and the end to which it is used is explained. It is interesting to note that species with a breadth of uses can be regarded as sacred and attract a number of separate names to denote the different uses. It is obvious that Neville has worked closely with the Adnyamanthanha people in the preparation of this book and also that he has taken pains to research widely on early contacts the white people had with this Aboriginal community. He includes some of the early illustrations of artefacts and records a number of portraits of earlier inhabitants who passed the knowledge down. A comprehensive chart of the plant species, their native names, part of plant utilised, notes and page reference numbers is a really worthwhile addition. The response from the Aboriginal elders is an enthusiastic blessing for this publication as they are proud to have another recording of their culture and language that is contained in this permanent form. A most interesting book that will give a lot more than just the plant ID to visitors to the Flinders Ranges and adds to the library of publications on this subject, such as Peter Latz 'Bushfire and Bushtucker', IAD, 'Punu Yankunytjatjara Plant Use' of Central Australia and 'Rirratjinu Ethnobotany Aboriginal Plant Use from Yirrkala, Arnhem Land' and the recent addition, 'Aboriginal People and Their Plants' by Peter Clarke.